Ever wonder about binary, Boolean algebra, and bitwise operations? All of computing can be broken down to the combination of these three topics, and there are many examples of their uses in the real world. In this article we'll dive into the basics of these three concepts and see how they're related and used in practical applications. Let's begin with the very basics by explaining binary representation. In day-to-day life we interpret numbers in base ten; each digit can range from zero to nine and represents some power of ten. As you may already know, binary is a number system of base two. This means that it consists of only the numbers zero and one. Each digit represents a power of two. This may be a difficult concept to wrap your head around if you aren't already familiar with it, so it's best to begin with an example. 1234 is a number in base ten. The "4" on the right represents the 1's digit (i.e. 4*100) the "3" is in the 10's place (i.e. 3*101) the "2" is in the 100's place (i.e. 2*102) and the "1" is in the 1000's place (i.e. 1*103). 00101101 is an example of a number in binary. The "1" on the far right is 1*20 which is 1. Then we have 0*21 which is 0. Then 1*22 which is 4, and so on. When we've gone all the way through the bits (the term meaning 'binary digit') we end up with 1+4+8+32 which equals 45 in decimal. Next we want to know how we can represent negative numbers in binary. The term signed refers to the inclusion of both positive and negative values whereas unsigned numbers are only positive. Let's take a brief look at a few different methods for signed binary integer representation that have been used in the past (it will help to understand the reasons behind the current typical method). This is a method of representing signed numbers in binary in which the first bit means "negative" if it is a one and the rest of the bits indicate the magnitude, i.e. the actual numeric value. The downside with this representation is that there are two ways to represent zero: for example: 1000 (which is -0) and 0000 (which is 0). The first bit represents the negative sign if is a one. To make a number negative, you flip every bit. So, for example, 01011 (i.e. eleven) when negative is 10100. This method has the same problem as Sign-Magnitude, however, in that there are two ways to represent zero. In the case of -7 (i.e. 1001), the value is (-8)+0+0+1 which equals -7. To summarize, the digit which contains the negative value is on the far left, and all other digits are positive values which are added. A quick tip: to invert a positive number (i.e. to make it negative), simply flip the bits and add 1. In this technique, you first set a bias to bring everything into the positive range. The general formula for determining the bias is 2n-1-1. So, for example, assuming a three bit number, you would have a bias of three. This might seem like an extremely over-complicated technique, but we're going to come back to this later when we get into floating-point representation, so don't just brush it off. So as you know, the digits in binary (i.e. bits) go by powers of two for integers, and they also go by powers of two for non-whole values too, but how do you represent it? Next we'll take a look at floating-point numbers. A floating-point number is basically a number with a decimal point (technically actually a 'binary point' in binary), but more specifically a moving decimal point (i.e. one that floats). This is different from a fixed-point number which would always have X integer places and Y decimal places. Fixed-point representation is rarely seen since it has a very poor range of representable values. 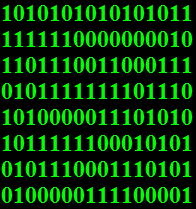 Say you have this number in binary: 1.111 the first digit on the left is going to be 1 (i.e. 20) and to the right of the dot you have 111. From here we just keep subtracting one from the exponent as we move to the right. So we had already 20, next is 2-1 then 2-2 and so on. So the number 1.111 will be 1 + 0.5 + 0.25 + 0.125 which is 1.875. This is an example of fixed-point representation. As mentioned, we can't just represent decimals like that with a fixed-point since we have a limited number of bits that we can use. Thus the idea of the floating-point number was created. In this, you use something similar to scientific notation to move the decimal point around so that you can represent larger numbers. Hence the term floating-point. If the exponent is all zeroes, the fraction starts with a leading zero. If the exponent is all ones and the fraction is zero, you get infinity (positive infinity if the sign is positive, and negative infinity if the sign is negative). If the exponent is all ones and the fraction is not zero you get NaN (i.e. not a number). Your computer's integrated circuits use these things called logic gates that to make certain things happen. These gates are AND, OR, NOT, XOR, NAND, and NOR. AND means that the outcome will be true if both inputs are true, otherwise the output is false. OR means that the outcome will be true if either input is true. If both inputs are false then the output is false. XOR means 'exclusive or'. It works like an OR gate except it only returns true if exactly one of the inputs is true, and it returns false if both are true or false. NAND is basically just 'not and'. It gives the opposite value that an AND gate would give. NOR is just 'not or'. It gives the opposite value that an OR gate would give. For the case of NOR, it can be easily converted to simple English by thinking of it as "neither A nor B". Bitwise operations are very much like Boolean logic operations. Bitwise operators are used in computer programming to perform logical operations on bit strings at the level of their individual bits (rather that on the object as a whole). You already know how the AND, OR, NOT, and XOR operators work from the Boolean Logic section, but you probably didn't know that you can apply them to full binary strings. For example, if you have 10100101 | 10110111 it would be the same as apply OR to each corresponding digit for the two strings. The same goes for the AND and XOR operators. The NOT operator works slightly different than you may expect. If you have any non zero number, the NOT of it will give zero, and the NOT of zero will give one. Now, if you remember back to the beginning of this article, we briefly learned about what One's Compliment was. Basically, if you use the ~ operator on a number, it will flip all of the bits, so 1011 would become 0100 (similar to how one might have expected the NOT bitwise operator to work). Right shift does exactly what it sounds like. It shifts the bits to the right. So, if you have the binary number 0101000, and you use the right shift operator on it like this: 0101000 >> 3, it will shift all of the bits to the right 3 places, so you will get 0000101. This is the same as dividing by 23. Note that the right shift does preserve sign. So if you have a number like 1011 (this number is negative since the sign bit on the far left is one) and you shift it to the right, it will fill in the leading bits with ones. So 1011 >> 2 will be 1110. Also note that since these are integers, there will be a round-off error. Left shift works the same way as right shift. It shifts the numbers to the left. This always fills in the new bits with zeroes though. Left shift (x << n) is the same as x*2n. You can create all of the operators used in programming with these as well as the typical plus operator. There are many more things that you can do with these, but you are probably thinking "why the hell would I waste my time doing that crap when I can just use an if statement?" Well the simple explanation is that using bitwise operators is actually much faster and more efficient as far as processing time than using for loops and if statements. So if you are in dire need of performance in your code, this might be the way to go. If you're interested in seeing more about using bitwise operations, check this out: Bitwise Operations Examples.